Months ago, I discovered a new-to-me snack bar at Whole Foods. So few of them, all recognizable. I bought two bars, devoured them (not at the same time), then contacted the company to see if they'd be interested in sending along a few samples in exchange for my review. Needless to say, I'm a lucky girl. 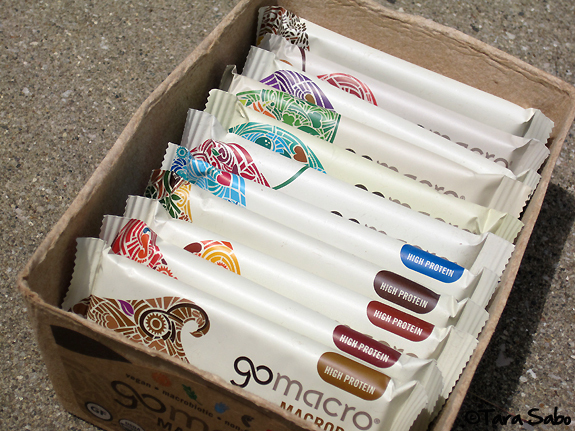 You guys, GoMacro bars are ridiculous in the best way possible. They are so good and so good for you. With 11 different flavor combos to choose from, you're bound to find at least one (probably more) that interests your taste buds. Some are higher in protein than others, which is great for when you need some sustenance in between the gym and your next engagement. And for those of you that eat a gluten-free and/or vegan diet, you're in the clear with these guys. This company practices the "eat food, not too much, mostly plants" principle. Which then lends itself to the whole macrobiotic thing. What is a macrobiotic diet? According to Wikipedia, it is "a dietary regimen which involves eating grains as a staple food, supplemented with other foods such as local vegetables, and avoiding the use of highly processed or refined foods and most animal products." To me, that just reiterates the fact that these bad boys lack all the gunk commonly found in protein and snack bars. That right there is the Granola Coconut bar. It's not necessarily one of the added protein types, but I wasn't in need of added protein at the time. 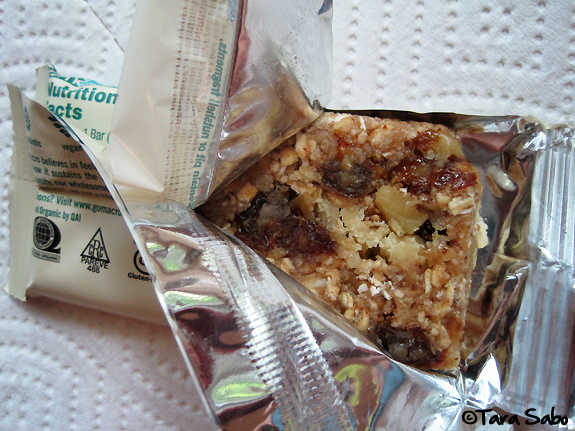 Just a snack and this super-dense, totally delicious bar served it's purpose. I wasn't sure how I'd feel about the coconut (because you know how I feel feel about coconut), but it didn't bother me. 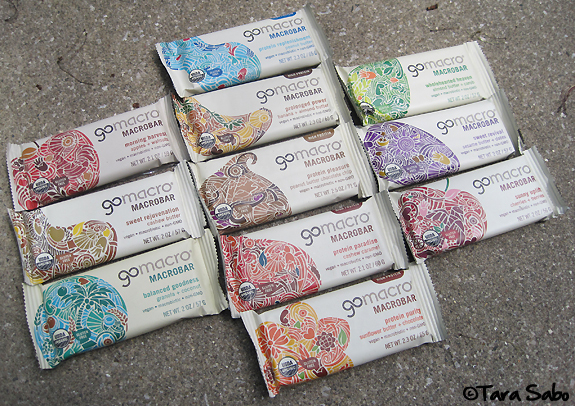 In fact, I have yet to eat a GoMacro bar that I didn't like. I'm not kidding. They're all good. I'm getting hungry for one just telling you about them. But, to be honest, one of my most favorite things about these bars has nothing to do with eating them. I love that they come from a family owned business built to promote a healthy, sustainable lifestyle. One family member developed breast cancer and subsequently turned to the macrobiotic way as a means to combat the cancer. So what started as a kitchen experiment blossomed into an awesome business. Yay for the little guys making it big in this food industry world we live in! With that, I offer you a box. I would love to try apples and walnuts or the peanut butter chocolate chip! The banana & almond butter sounds delicious! I would love to try the peanut butter chocolate chip flavor. Can't choose just one. Either cashew caramel or almond and carob! Sunflower butter and chocolate!! Yummy. Would love to try them all. Fabulous giveaway! I don't have a favorite...I want to try them all. peanut butter chocolate chip and sweet revival! the sesame butter and dates one sounds great! I have had several of these flavors before. I would love to share them with my mom and boyfriend. The morning harvest one looks yummy. I am a GoMacro addict! I always have a box of the peanut butter protein variety in my house, and they are my go-to post-workout food. I want to try the granola coconut one and the morning harvest one! I just tried these bars the other day for the first time and they are sooo good. 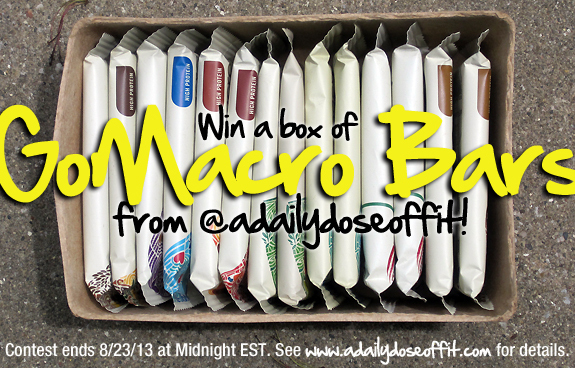 ALL CAPS FOR MY LOVE OF MACRO BARS BABY!!! My favorite is the Peanut Butter Chocolate Chip! I wish they sold them in my area! Granola an Coconut is right up my alley! I can't pick one that I like the best,because they are all good. It is not easy to get them around my area, so I asked one of my grocery store that I shop at all the time to try and get them also I asked the health food store that I get all my supplements from to see if they could get them as well. I have a bar every morning to give me the energy I need to start my day. I love GoMcro Bars!!! The coconut ones are GREAT! Sunny Uplift is my favorite. And I love that the bars are gluten-free...hard to find! Oh my gosh. Peanut Butter Chocolate Chip. Yes please. mmm peanut butter chocolate chip! Protein power cashew caramel intrigues me, because I LOVE caramel...so caramel taste without the caramel would be amazing!